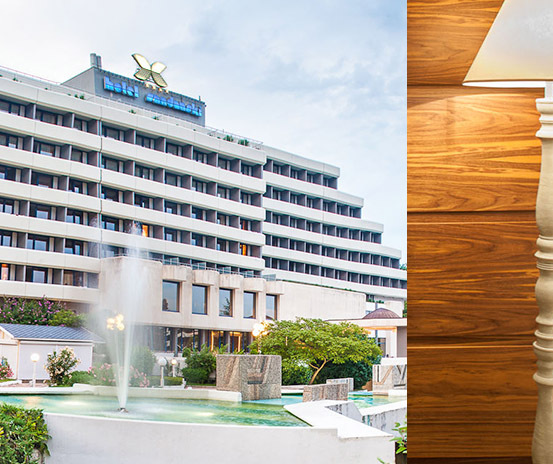 Interhotel Sandanski is situated in Southwestern Bulgaria, a region well known for its healing climate and thermal springs. Located in the center of Sandanski, just a few steps from the picturesque City Park, the main shopping street and close to many cultural and historical sights. Interhotel Sandanski offers one of the largest medical centers for medical treatments and rehabilitation of the Balkan Peninsula. The hotel has 285 comfortable rooms and suites, three restaurants, lobby bar and a pool bar. The guests can use three mineral water pools, one of which is thermal with a temperature of the water 38 ° C.
The complex has built five new tennis court flooring with high technology, suitable for organizing and professional tournaments. For seminars, corporate events, workshops and more, the hotel offers four conference rooms with a capacity from 30 to 250 seats, space for exhibition space and presentations.